NEOWIZ announced yesterday that Bless Online, their fantasy MMORPG, will launch on May 30th via Steam Early Access. 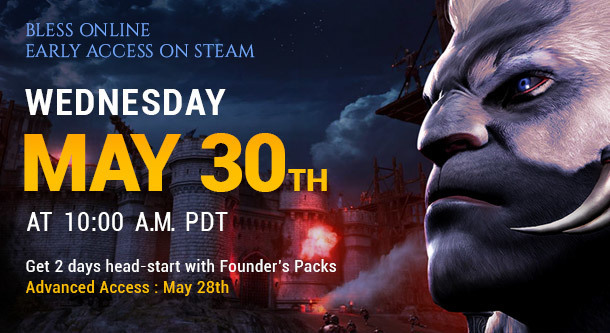 The price will be $29.99, though NEOWIZ will also sell three different Founder’s Packs enabling a two-day headstart and the additional perks described below. When Bless Online debuts on Steam Early Access, it will feature seven races (Habicht/Amistad, Lupus/Pantera, Sylvan Elf/Aqua Elf, Mascu), five classes (Ranger, Mage, Paladin, Berserker, Guardian) and nine dungeons, while the level cap will be set at 45. Localization has been confirmed for German (text only) and English (full voice-over). North America’s servers will be set in Virginia while European servers are located in Frankfurt, Germany; other regions such as China, Japan, Korea, Taiwan, Hong Kong, and Macao are going to be locked. NEOWIZ also hosted a live stream where they answered many questions from the fans regarding the improvements made for this Western release. You can find a list compiled by the Reddit community at this address; meanwhile, read our interview with the developers in case you missed it a few months ago.